My son Josh is an adventurous eater. He loves to try new things, sometimes things that I would never imagine. I love to take him out to eat because you never know what he’s going to order. He rarely orders the same thing twice but when he finds something good he wants to recreate it at home or rather wants me to recreate it. 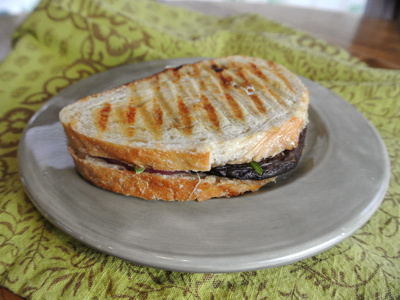 Recently we went to a little cafe that made the most amazing panini sandwiches. He ordered the vegetarian Portabella Panini and just raved about how good it was. After a bit of thought I came up with a close version of the cafe’s. They listed a sun dried tomato pesto and feta cheese on their panini while I used spinach pesto and fresh mozzarella. Either way it’s one tasty panini! 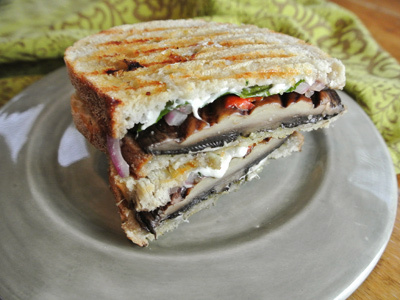 Our panini had a portabella mushroom, roasted red pepper, pesto, spinach leaves with fresh mozzarella on sourdough bread. 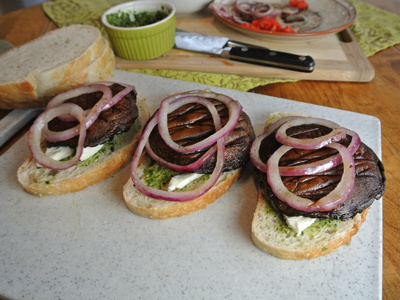 Josh thought some grilled red onion would be good too so we added some. 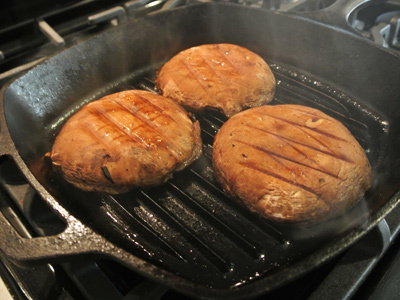 The portabella’s needed to cook down first so I set them in a hot grill pan on top of the stove and drizzled them with olive oil. I turned them over every 3 – 4 minutes as they cooked down and began to release the juices within. They had reduced in thickness by half by the time they cooked through. I set the onion slices in the same grill pan, drizzled with olive oil with a little salt and pepper. I turned them after a couple minutes and in no time they sauteed and became translucent. Took about 4 – 5 minutes total time. Time to put the sandwich together. I had 3 portabella’s so I’m making 3 panini’s. Lightly spread pesto over 3 slices of sourdough bread. 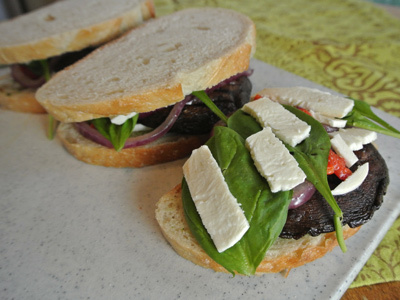 Arrange a layer of fresh mozzarella so that the cheese will melt evenly over the sandwich. 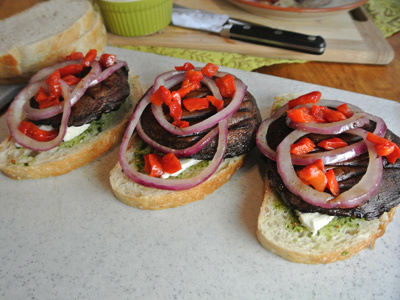 Place a portabella mushroom on each sandwich. Roasted red pepper . . . Spinach leaves and another layer of fresh mozzarella. Top with sourdough bread. Spread some margarine or butter on the sourdough bread and place on a cast iron grill or griddle, butter side down. I like to grill over medium heat so that the cheese has time to melt and the bread won’t burn. Place the press on top. 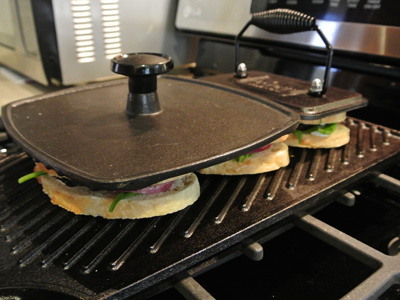 If you don’t have a press, place a heavy cast iron skillet over top. That works too! When the bottom crust begins to brown and crisp, flip to brown the other side. Butter the top slice before you flip the panini. Nice and crisp on the outside! Layers of veggies with pesto and melted mozzarella! Umm! Heat a grill over medium high heat. 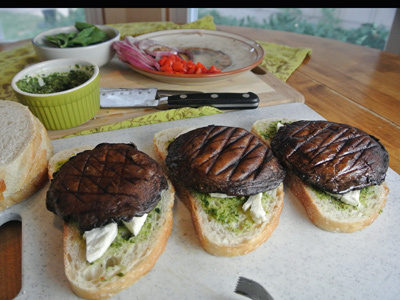 Drizzle olive oil over portabella mushrooms and place on the grill. Turn the mushrooms every 3 – 4 minutes until they have softened and reduced in thickness by about half, (this took about 10 – 12 minutes total). 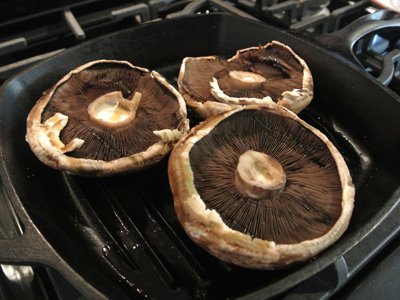 Remove mushrooms to a warming plate. 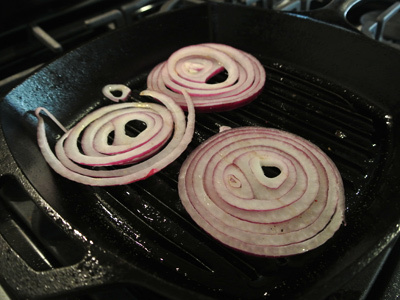 Set the onion slices on the hot grill with a drizzle of olive oil, salt and pepper. 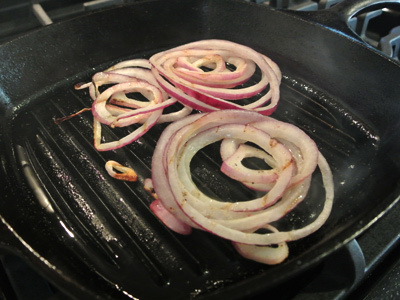 Grill 2 – 3 minutes on each side until the onions become soft and translucent. 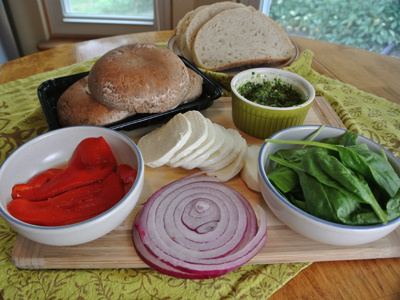 Set out 3 slices of sourdough bread. 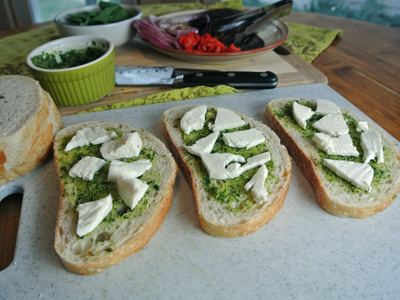 Lightly spread pesto over bread and add a layer of fresh mozzarella cheese. 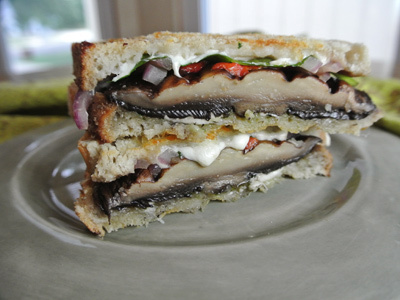 Layer with the portabella mushroom, onion slices and diced red pepper. Top with a few spinach leaves, another layer of fresh mozzarella and top with the remaining 3 slices of bread. Butter the outside of the bread pieces and set on a hot grill plate. 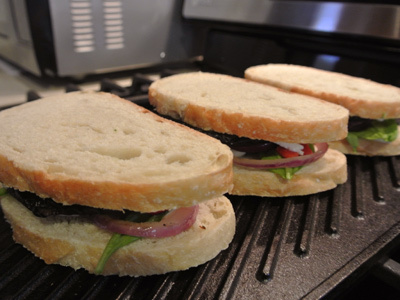 Use a press or heavy skillet to press the sandwich down. Grill several minutes on each side over medium to medium high heat until the bread starts to brown and crisp and the cheese begins to melt. This is the combination of everything I love haha yummm!! I’m glad! Thanks for stopping by! 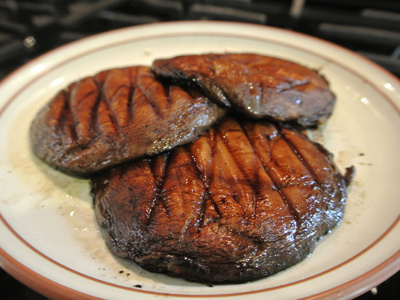 I love portabella mushrooms! They are so meaty and flavorful. This looks yummy Jan! Thanks! I’m new to the portabella’s but they are quite good!